Real estate investors commonly look for mispriced properties. Often such properties, aka "fixer-uppers" in the field, are under-managed or mismanaged. Finding such a property represents a "turnaround opportunity" wherein the owner can add entrepreneurial value. 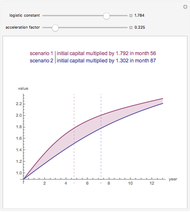 The outcome, if successful, produces a growth curve that is initially steep during the early years of the turnaround process, followed by a "normal" period of income growth due to lease escalations, inflation, etc. 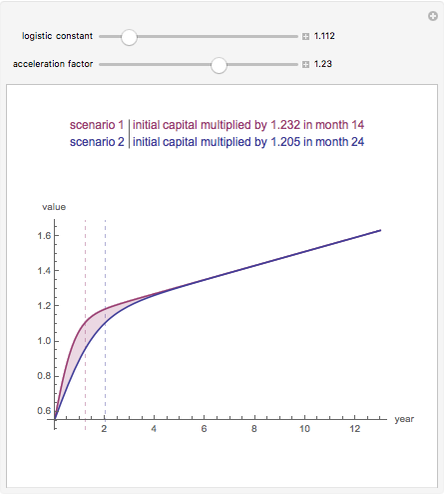 Modeling this process involves a logistic growth function, which has many applications in science. Two variables control the process. One is the logistic constant, which answers the question "How high is up?" by setting the upper bound of entrepreneurial growth. 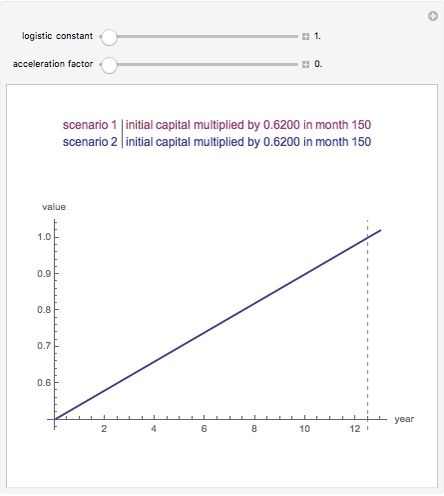 The other is the acceleration factor, answering the question "How fast can the turnaround process take place?" 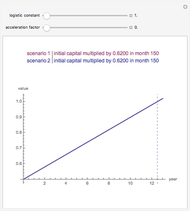 The table provides the multiplier of initial capital at the point in time indicated by the dotted line. 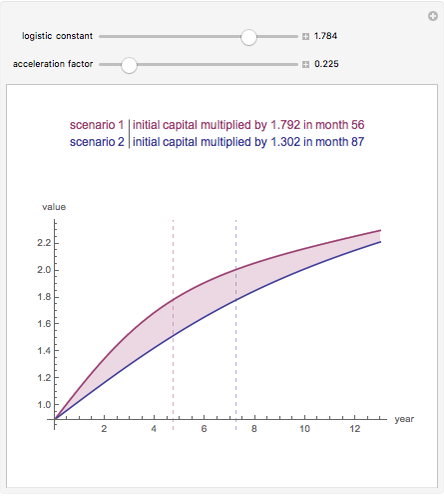 For the red scenario, this is the point when, in the hands of the most efficient operator, the project is "optimized" and the remaining return is based solely on normal long term stabilized growth. The equivalent outcome is in blue for the less efficient operator. When the acceleration factor is zero the equation is linear and there is no difference in the scenarios. 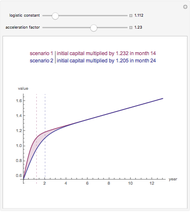 At some acceleration rates the two lines do not converge within the support of the plot. This may be safely ignored, as turnaround projects are usually short term, and if the project cannot ripen with a few years it is not undertaken. More information is available in Chapter Four of Private Real Estate Investment and at mathestate.com. R. J. Brown, Private Real Estate Investment: Data Analysis and Decision Making, Burlington, MA: Elsevier Academic Press, 2005. Roger J. Brown "Value Added Growth Model"